If you have landed here from the Pixel Scrapper blog train, just scroll down a little to find my contribution. I've been in the mood to create quick pages and with Christmas approaching I thought I would make a few to share, kinda my gift to all of you. These are available for FREE at Pixel Scrapper. 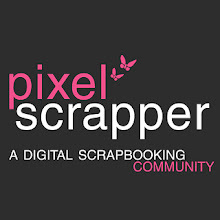 If you haven't already signed up at Pixel Scrapper, you can do so for FREE! This quick page is in .png so it can be opened in any program. The photo opening is transparent so all you have to do is place your photo below the page and you have your scrap. I hope you enjoy it!! HERE is the direct link to download.